Since we specialize in gutters and gutter cleaning in Sonoma and Marin Counties, CA, it should be no surprise that Nor-Cal Maintenance offers a variety of critical gutter-related services, from the installation of gutter covers to providing rain gutter maintenance, gutter cleaning, gutter repairs and more. 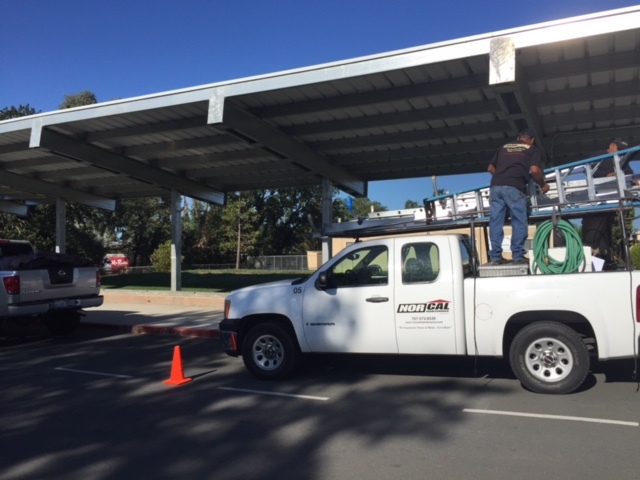 Local school districts, HOAs, strip malls and other commercial clients rely on Nor-Cal Maintenance to keep their windows looking and functioning their best. We offer window washing services, screen installation and screen restoration, and are happy to work on both interior and exterior windows. Cleaning the panels is critical. To receive the maximum amount of electricity the panels should be cleaned no less than once per year some cases even twice. We provide an environmentally safe way to professionally clean each panel no matter how many or few or how easy or difficult the access we have the technology and capabilities. Call today for a free quote and to set up a regular peace of mind maintenance program. Maintaining a clean and attractive exterior is a key aspect of having a welcoming commercial space. In addition to our gutter and window services, Nor-Cal Maintenance provides a variety of additional exterior services for our commercial clients, including pressure washing and power washing, deck services (refinishing, staining and washing) and bird abatement services. In addition to the services listed above, Nor-Cal Maintenance provides free, highly personalized consultations to come up with start-to-finish solutions to our clients’ one-time or ongoing maintenance projects. If your school, business, winery, apartment building, restaurant or other commercial enterprise requires pressure washing or gutter repairs in Sonoma and Marin Counties, CA, please give us a call at 707-321-8477 to schedule a consultation. We look forward to serving you! "Allen and Jared arrived 5 minutes early, carefully worked so that no gutter was dented, cleaned up completely, and even returned items to th..."
July 1, 2018 Arthur G.
"Install or Replace Gutter Covers and Accessories : Dave and crew were excellent. They were professional, courteous, and explained the proces..."
"Nor Cal Maintenance was able to fit in cleaning and flushing my gutters prior to a paint job I had scheduled with very little notice. Dave r..."
"I knew I wanted our windows cleaned professionally soon after we had them installed, but finding just the right team is something to serious..."
"Great job! Extremely efficient, clean & very helpful. Highly recommend Nor Cal. " Honoring Military Servicemen and Women (active and retired) and all First Responders. We thank you and offer $25 off all services. We accept Mastercard, Visa, Discover, American Express as well as cash and check.